There are three major uses of copper in today’s world: constructions, electrical and electronics, motors and engines. Copper is the 3rd most widely used metal worldwide. Hence, many countries play a relevant role in its market. Firstly, Chile is the major producer and exporter of both raw copper and refined copper products. One-third of the world’s copper mines locate within Chilean borders and Codelco is the largest copper producing company in the world –although state owned. Along with Chile, other significant exporters are Peru, the US, Russia and Japan. Top importers are China, Japan, India, Germany, and the US. China itself demands over 40% of world’s copper (10 million tonnes). The quantity is expected to grow to 11.5 million tonnes by 2020. Although China produces some copper, it actually needs more due to its 6-7% annual growth rate and large constructions and electronic markets. · China’s imports - the country’s massive import quantity alone is very influential on copper’s price. In the past 10 years, copper price has been volatile. 2008’s Financial Crisis saw a drastic drop in copper price. The housing market’s fall in demand and prices, meant shrinking demand for copper, as copper is largely used in constructions. In 2014 copper price was stable again at $7000/ton. Yet, copper price’s declined again since 2015 due to devaluations of the producing countries’ currencies, decreases in energy prices (that reduced the intensive mining energy’s costs) and commitments of copper producers to cut production costs. Today, the price for copper seems to be stabilizing again at $6’884/ton. Yet, this stabilization may be compromised by a forecast of a shortage of copper ore in 2019. As demand for copper increases, supply seems unable to keep up the same pace. A shortage may increase copper prices. Copper’s top three importers China, Japan and India may suffer from this. In addition, their exports may be damaged as well, as they have many copper refineries domestically. Copper’s production is expected to rise by 3% in 2018 and 2019. This implies a total amount of 22.6 million metric tonnes of copper passing through the market by 2019! As technology levels improve, copper demand rises as well. Long-term determinants of copper’s price are to be found in batteries’, EVs’ and technologies’ markets. Besides, the recovery from the Financial Crisis in the Western world may imply a returning demand for construction and housing. Short-term determinants are China’s import and Chile’s stability. 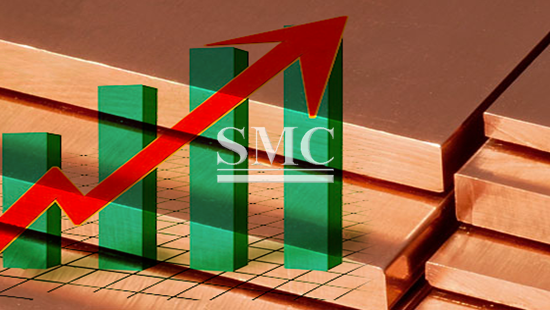 At Shanghai Metal Corporation we are aware of the large market in which copper is involved. Metals being the core of our business, we passionately keep updated about their changes in the global economy. For our customers, we proudly provide a variety of high quality products worldwide - such as Rolled Copper Foil, Beryllium Copper Sheet and many others. For further information and a full list of products, please click here.